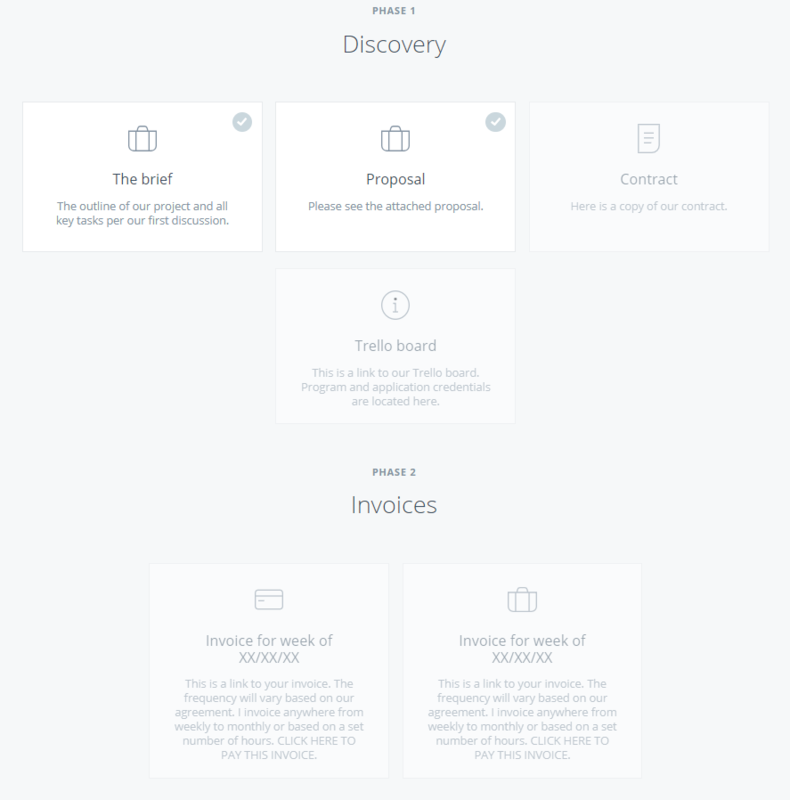 I want to share a quick introduction to Client Portal. Have you heard of it? It’s a WordPress Plugin that was created by my client (there’s the first half of my disclosure;-)) Laura Elizabeth. You see, I’m a virtual assistant and Laura is my client! So not only am I using it, but I’m working on the back side of it. I have quite a grasp of how it can be used by all different types of businesses. But since Laura created it for herself to use with her design clients, she has a very large design audience. 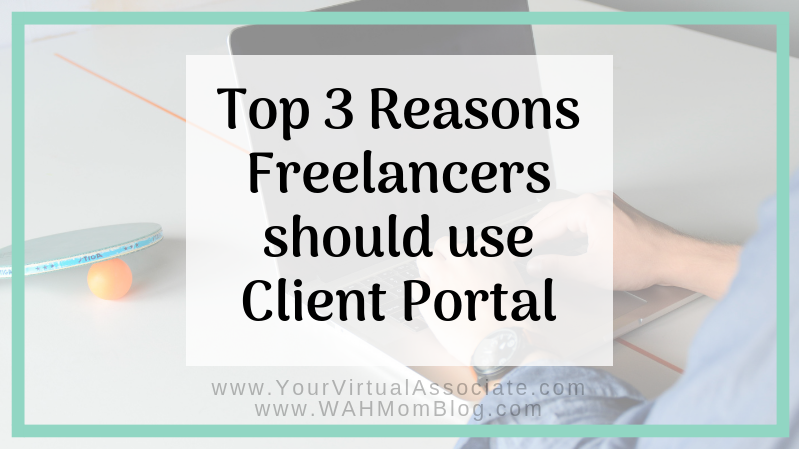 What I want to focus on is how freelancers such as myself, can make use of Client Portal. Think to yourself – what does my business process look like to an outsider? That outsider being a new potential client. What do they see? Do you give them a contract? Are your invoices and documents neatly organized? Now think about what your competition is doing. What if you present a portal as soon as you get off the phone with a potential client? Just a follow-up – “thank you for your time” message. Hey, Potential Client ABC, I set you up in my system just in case we decide to work together. When you get inside my client portal, you’ll see our preliminary discussion, which you are free to add comments to if you feel I didn’t understand something exactly as you intended. You’ll see some grayed out sections which will become active if and when we start working together. This shows Potential Client ABC that you are a professional, serious about your intentions to work with them, and organized! Client Portal will allow you to organize all of the documents that you use for your clients. I am a fan of both Dropbox and Google Docs. But I find I’m using Google Docs more and more. So what I’m doing is linking my doc right into the portal. I can work on the doc from my Google Suite. But anytime the client wants to look at it, all they need to do is log in to their Client Portal. I also have a link to their invoices. I’m still using PayPal to create my invoices, just like I always have. But I’m adding the URL to my client’s project. So again, I look incredibly organized and professional. AND my client only has to go ONE PLACE to see everything that I’m working on for them – it’s so convenient! I have a small handful of clients right now. If you’re a freelancer, you likely have a small handful of clients too, or maybe more. I have them all lined up in my Client Portal dashboard in WordPress. As I work on things for my clients throughout the day, I can easily switch to their project if I need to make any changes, like adding a module to keep track of a new project they just assigned to me. But for the most part, I’m just working along like usual. The difference is that everything I’m working on is linked to their project. So any time they want to see what is current, all they have to do is log in to their secure project (password protected and private to each of them individually) and they can see the current version of basically everything we’re working on together! I’m receiving fewer emails because my clients know they only have to look one place to find what they’re looking for. It’s convenient for them and I spend less time out of my day looking for something I sent them two weeks ago! Do you want a Client Portal Discount? Lucky for you – I have one! Follow this link to see more details about Client Portal and to purchase your copy today! If you follow my link, I will get a little kick-back for telling you about it, but it doesn’t change your price (and there’s the second half of my disclosure). If you’re gonna try it anyway, please help out a fellow freelancer and use my code! 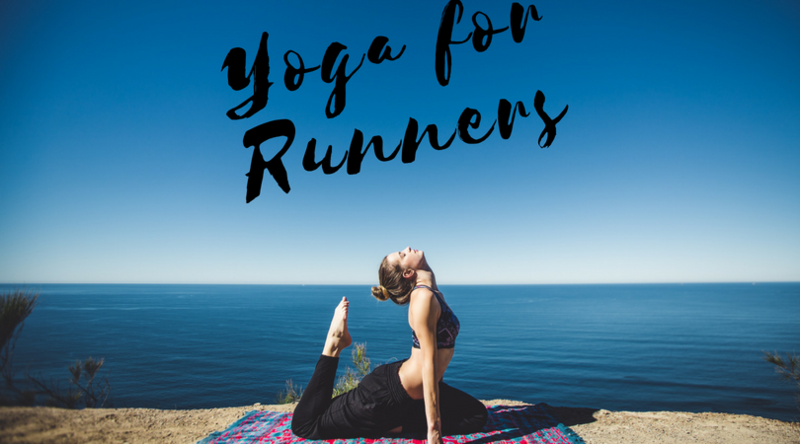 When you get there, use discount code CARRIESdiscount to receive 10% off! If you have any questions about Client Portal, you’re welcome to email me at carrie@yourvirtualassociate.com. Or you can send your questions straight to support@lauraelizabeth.co. Maybe I’ll still be answering your questions! One perk of Virtual Assisting is to work from home! 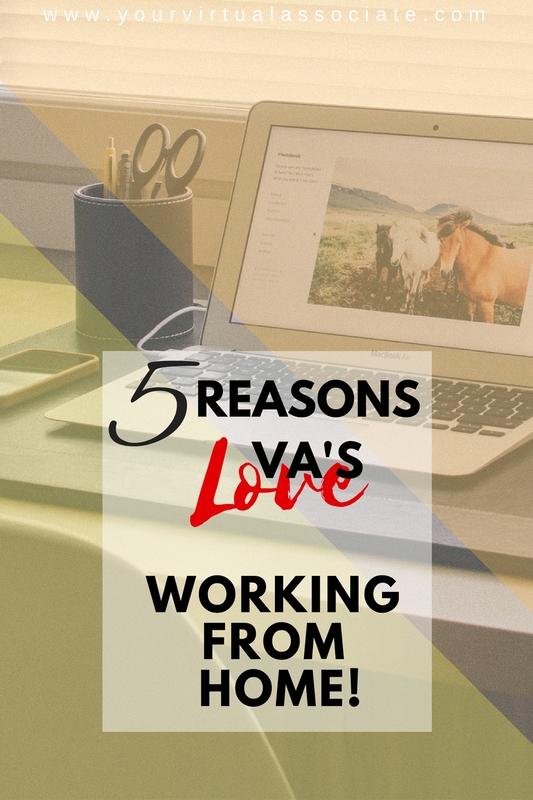 Read about other reasons VA’s love working from home! I can tell you in one sentence why I love working from home: I love being home for my kiddos! But I want to go into some specifics, as to why VA’s love to work from home! In case you are wondering, VA’s are virtual assistants. Virtual means that they are working in the “virtual” world. On-line. Assistant means they are assisting, or helping, someone with something, usually a small business owner or entrepreneur with business related tasks. 1. My “Home Office” isn’t always at home! While I ultimately want to end up working from a beach, right now my goal is to be working from my home office so I can be more present while my kids are young. Virtual assisting allows me to be home for occasions, like the first day of preschool! (That happen to be today!) I was able to drop my daughter off at school and be first in line to pick her up afterwards. That was really great for both of us! I’m also free to take my kids to doctor appointments, play dates, and the library. Thanks to the internet and Skype, I took my business on the road this summer when we went to visit my folks for a week. I set myself up at a small table in the kitchen and got to work! No, I’m not talking about the number of breaks I can take, or that no one is watching the clock while I take a break (although that’s true). I’m talking about what I do during my breaks. Instead of walking to the coffee machine or water fountain in an office, I’m walking into my kitchen to refill my coffee, and I might also do some dishes or start a load of laundry. My “break” time is productively filled with chores that I would normally have to do at night. After returning from a long day of work, who wants to do laundry and dishes?! Sometimes break time is spent reading a book to my children, or helping my daughter with a puzzle, or “smashing” the Play-Doh so she can make more butterflies! I might make a run to the post office or bank, which in the old office days, that was hard to do! I remember actually having to take a half-day of vacation so that I could do errands such as the PO and bank! Crazy! 3. Who’s the Boss? I’m the Boss! I am my own boss and that really is priceless. If I need to make more money for our family, I know what I need to do to get more work. I’m the only one telling myself that I need to work harder or work more. Although my husband does try to tell me that too, I still know that I’m the boss! I love the variety that I encounter as a virtual assistant. I have learned about many different subjects from the different people I have worked with. At one point in my day, I am working on website updates for someone in the healthcare industry. Later in the day I may be working on an email campaign for a dance instructor. The variety is amazing! It heightens my level of interest in what I am doing for my clients, because I’m not working on the same things for hours on end. 5. Any time of day. My mind seems to focus better later in the day. So it’s great that I can choose to work whenever is best for me. Sometimes you’ll have a client that needs work to be done during a certain time of day, but not always. Usually it’s work that just needs to be done and they don’t care how or when you do it, as long as it gives them the results they are looking for. 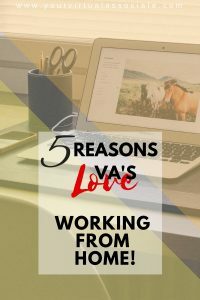 There you have it – 5 reasons VA’s love working from home! But I’m sure the reasons are endless! 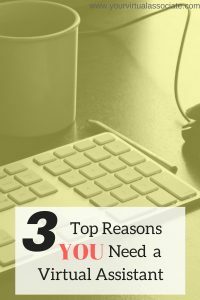 Keep reading to learn why you should have a virtual assistant! (1) Get back to doing what you love!! There is something you are passionate about, and it’s the reason you started your business!! But now that you have a business doing what you love, you have to do all kinds of other things that you AREN’T passionate about! The solution: you need a virtual assistant! When you work with a virtual assistant, you can delegate the tasks that you don’t like and spend more time doing what you love! (2) You know you need a social media presence, but you don’t know how, nor want to learn it! Social media can be time consuming as well! Get connected with the right virtual assistant and you can tap into a whole new world of possibilities. Social media isn’t just “social”. Business connections are made through social media every day! Your network is an asset and a virtual assistant can help you interact with your network and beyond. The World Wide Web is full of people who might want what you have to offer! (3) You want to grow your business, but you don’t want to manage an employee. When you hire a full or part time employee, you have to consider many things. They need a computer and phone, a work space, not to mention benefits like vacation pay and insurance! When you contract with a virtual assistant, you don’t have to do any of that! 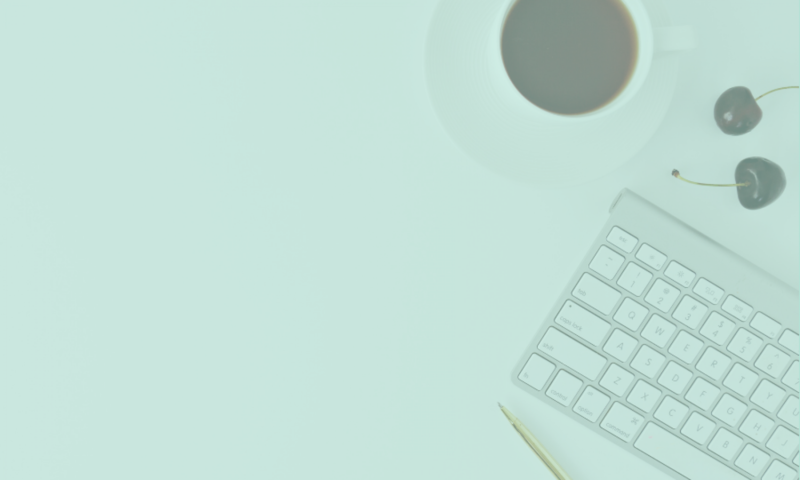 In fact, a virtual assistant should be a trusted partner who you can bounce ideas off of. This list is only 3 reasons you should want to have a virtual assistant. Can you think of other reasons why you should have a VA? I would love to hear from you!